Abingdon (also known as the Alexander-Custis Plantation) was an 18th- and 19th-century plantation that the prominent Alexander, Custis, Stuart, and Hunter families owned. 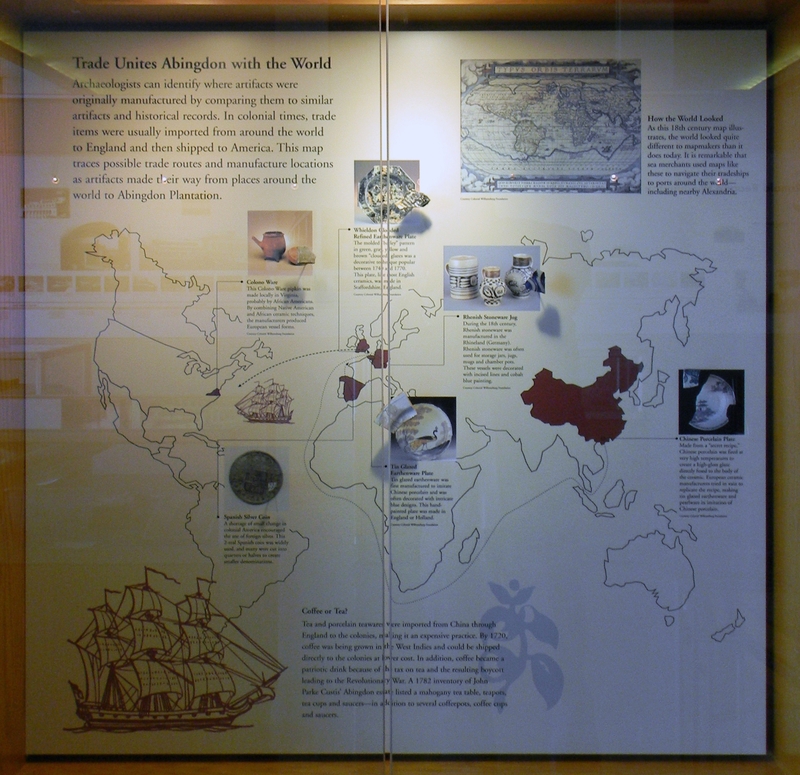 The plantation's site is now located in Arlington County in the U.S. state of Virginia. Abingdon is known as the birthplace of Eleanor "Nelly" Parke Custis Lewis (March 31, 1779 – July 15, 1852), a granddaughter of Martha Washington and a step-granddaughter of United States President George Washington. Published accounts have credited Abingdon as being the home to the progenitor of all weeping willows (Salix babylonica) living in the United States. Ronald Reagan Washington National Airport, which occupies part of Abingdon's grounds, contains indoor and outdoor displays that commemorate the plantation's history. The land that contains Abingdon was originally part of a larger holding granted in 1669 by letters patent to shipmaster Robert Howson for headrights for settlers that he had brought to the Colony of Virginia. Howson soon sold the patent to John Alexander for 6,000 pounds of tobacco. Alexander was a descendent of the MacDonald clan of Scotland and was a son of the Earl of Stirling. He immigrated to Virginia around 1653, settled in Stafford County and became a planter, surveyor and captain of the Stafford County militia. When Alexander purchased the Howson patent, the patent covered an 8,000-acre (3,200 ha) site (believed at the time of sale to contain only 6,000 acres (2,400 ha)) on the southwestern side of the Potomac River. The site was about 2 miles (3.2 km) wide and extended along the Potomac from Hunting Creek (the southern boundary of the present City of Alexandria) to the present northern boundary of Arlington National Cemetery. After John Alexander's death in 1677, one of his sons, Robert Alexander, acquired the Howson patent by inheritance and by a gift from his brother, Phillip Alexander. In 1735, Gerrard Alexander, a grandson of Robert Alexander, inherited the northern part of the Howson patent. In 1746, a survey map that Daniel Jennings prepared showed that Gerrard Alexander owned a house on a portion of the Howson patent that was north of Four Mile Creek. Shortly thereafter, in 1749, the town of Alexandria was chartered on a more southerly part of the Howson patent. The town was named in honor of John Alexander and his family, who provided land on which the town was founded. In 1761, Gerrard Alexander's will divided his estate between his sons, Robert, Phillip and Gerrard (2nd). In 1778, John Parke Custis (nicknamed "Jacky"), the son of Daniel Parke Custis and Martha Washington and the stepson of George Washington, purchased Abingdon and its 1,000-acre (400 ha) estate from Robert Alexander. Custis had been eager to obtain real estate in the Abingdon area on which to raise his family. However, Jacky Custis' eagerness and inexperience allowed Robert Alexander to take advantage of him in the transaction, because compound interest during the 24-year term would eventually transform the £12,000 purchase price into payments totalling over £48,000. (Some sources claim that General George Washington purchased Abingdon for Custis.) When he learned of the terms of the purchase, Washington informed Custis that "No Virginia Estate (except a few under the best management) can stand simple Interest how then can they bear compound Interest". Jacky Custis chose Abingdon because it was equidistant between the Washingtons' home at Mount Vernon, and the family home of his wife, Eleanor Calvert (Mount Airy estate, whose restored mansion is now in Rosaryville State Park in Prince George's County, Maryland). Eleanor Calvert was a descendent of Cecilius Calvert, second Lord Baltimore, a member of the Parliament of England and the recipient of the charter for the Maryland colony. During the year (1778) that Jacky Custis purchased Abingdon, his neighbors in Fairfax County elected him to the Virginia General Assembly as a delegate. Shortly after moving to Abingdon, Custis' wife gave birth to their third surviving daughter, Eleanor (Nelly) Parke Custis on March 31, 1779. Nelly, her older sisters, Elizabeth (Eliza) Parke Custis and Martha Parke Custis Peter, and her younger brother, George Washington Parke Custis, were then raised at Abingdon. However, Jacky Custis contracted "camp fever" in 1781 at the Siege of Yorktown while serving as Washington's aide and died shortly after Cornwallis surrendered there. Soon afterwards, George Washington "adopted" the two youngest Custis children, Nelly and George, who moved from Abingdon to live with the Washingtons at Mount Vernon. The eldest children, Elizabeth and Martha, remained at Abingdon. Custis' widow, Eleanor, remarried in the autumn of 1783 to a friend and business associate of George Washington, Dr. David Stuart. During the period that Dr. Stuart and Eleanor resided at Abingdon, Dr. Stuart served as a delegate from Fairfax County in the Virginia General Assembly and President Washington appointed him to be one of the three commissioners that oversaw planning of the nation's new capital city. In 1791, Dr. Stuart and the other commissioners named the new capital the "City of Washington" in "The Territory of Columbia" (see: History of Washington, D.C.). Dr. Stuart and his wife had sixteen children, at least three of whom (Anne Calvert Stuart, Sarah Stuart and Ariana Calvert Stuart) were born at Abingdon. Although John Parke Custis had become well-established at Abingdon, his financial matters were in a state of disarray due to his poor business judgement and wartime taxation. After his death in 1781, it took the administrators of the Custis Estate more than a decade to negotiate an end to the transaction through which Custis had purchased Abingdon. Because the estate had been paid for with Continental currency, the heirs of Gerrard Alexander brought suit against the Custis and Stuart families to recover their money. After years of litigation, Abingdon was returned to Robert Alexander in 1792. After Robert Alexander died in 1793, court-appointed commissioners surveyed his 1,090-acre (440 ha) estate and divided it equally between two of his sons, Robert and Walter. In 1800, Walter Alexander obtained ownership of the southern half of the estate, which contained the 545-acre (221 ha) on which the Abingdon house stood. In 1805, George Wise acquired a portion of Abingdon that included the house. Others acquired different parts of Walter Alexander's Abingdon property. The Wise family lived at Abingdon until "General" Alexander Hunter acquired 99-acre (40 ha) of the Abingdon property from George Wise and others between 1835 and 1842. At the same time that John Parke Custis purchased Abingdon from Robert Alexander, he also purchased outright a 1,100-acre (450 ha) tract of land from Gerrard Alexander (2nd). This more northerly tract, which was separated from Abingdon by a 900-acre (360 ha) tract that another Alexander brother, Phillip, had inherited, remained in the possession of the Custis family. George Washington Parke Custis, who inherited this land from his father (John Parke Custis) later constructed and named Arlington House on a plantation that he developed on the tract. According to accounts that historian Benson J. Lossing and others wrote in the mid- to late 1800s and early 1900s, John Parke Custis served on George Washington's staff during the Siege of Boston in 1775-1776 and became an emissary to the British forces there. According to these accounts, Custis befriended a young British officer on the staff of General William Howe, 5th Viscount Howe. While in Cambridge, Massachusetts, the officer gave Custis a weeping willow (Salix babylonica) twig that the officer had taken from a famous tree that Alexander Pope had planted at Twickenham and that was first of its kind in England. The officer had intended to plant his willow sprig wrapped in oiled silk along a stream on land he would seize from the Americans. However, following his army's defeat, he decided to give the sprig to Custis. Custis then planted the twig at Abingdon. The resulting tree reportedly became the progenitor of all of the weeping willows growing in the United States at the time of the accounts. One such tree reportedly grew next to Arlington National Cemetery near the northern end of George Washington Parke Custis' mansion (Arlington House). Another reportedly grew from a slip of the Abingdon willow that American General Horatio Gates had planted at the entrance to his Rose Hill Farm in Manhattan. That tree, which became known as "Gates's Willow", grew at a site that became the corner of Third Avenue and 22nd Street. The tree was reportedly cut down in 1860. However, 21st century writers have questioned the veracity of the accounts of the origins of these trees and their predecessors. "General" Alexander Hunter, a descendant of the Alexander family who had served at the Battle of Bladensburg during the War of 1812 as Adjutant of the District of Columbia Regiment of Volunteers, acquired Abingdon from the Wise family and others. General Hunter was a wealthy man who held a position in the Alexandria Customhouse and reportedly spent lavishly to renovate and beautify his house and estate at Abingdon. As U.S. Marshal for the District of Columbia, Hunter was a friend of United States President Andrew Jackson. Jackson frequently left Washington City to spend Sundays at Abingdon as Hunter's guest. Hunter reportedly had an inflexible rule that forbade office-seeking and discussions of politics during Jackson's visits. In addition to President Jackson, General Hunter also hosted Presidents John Tyler and James K. Polk at Abingdon. A chamber on the northeast side of the Abingdon house was referred to as "General Washington's room" during Hunter's ownership because George Washington had usually occupied this room while visiting his stepson, John Parke Custis. Some authors later stated that General Hunter had told visitors that he chose not to build a more pretentious structure because a house that was good enough for Washington was good enough for him. General Hunter died in 1849, entrusting Abingdon to his brother Bushrod Washington Hunter, until Bushrod's son, also named Alexander Hunter, could come of age. Bushrod Hunter had earlier served as a lieutenant in the United States Navy in 1846 during the Mexican–American War. In 1857, Bushrod Hunter served as a pallbearer at the funeral service for George Washington Parke Custis, whose house at the "Arlington Plantation" was not far from Abingdon. When the American Civil War began in 1861, Bushrod and Alexander Hunter (2nd) left the Abingdon plantation to join Confederate forces. During the war, a New Jersey regiment of the Union Army occupied the Abingdon plantation, calling it "Camp Princeton". In 1862, the 37th United States Congress enacted "An act for the collection of the direct tax in insurrectionary districts within the United States and for other purposes". In 1864, United States Tax Commissioners confiscated Abingdon and the nearby "Arlington Plantation" under provisions of this act after the owners of each property failed to pay their taxes in person. (A tenant had offered to pay Abingdon's taxes on behalf of the property owner (Bushrod Hunter). However, the government's tax collector refused to accept the payment.) The government then sold the Abingdon property to Lucius E. Chittenden, Register of the Treasury in the Abraham Lincoln administration. Chittenden then leased the property to Henry M. Bennett. We lived on a splendid estate of 650 acres, lying on the Potomac, between Alexandria and Washington. I doubt whether in the whole Southland there had existed a finer country seat; the house was built solidly, as if to defy time itself, with its beautiful trees, fine orchards, its terraced lawns, graveled walks leading to the river a quarter of a mile away; the splendid barns, the stables with fine horses (for which my father, a retired naval officer, had a special fondness), the servants quarters, where dwelt the old family retainers and their offspring, some fifty or more. ... The land was there after the war, but that was all. After the Civil War ended, Alexander Hunter (2nd), who by that time had inherited Abingdon, succeeded in recovering his land in a case that the Supreme Court of the United States decided on March 21, 1870 (Bennett v. Hunter) (76 U.S. (9 Wall.) 326 (1870)). 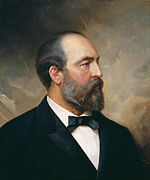 James A. Garfield, a Republican member of the United States House of Representatives who had been a Brigadier General in the Union Army during the Civil War and who later became the 20th President of the United States, was an attorney on Hunter's legal team. Congressman Garfield received as compensation 43 acres (17 ha) in a part of Abingdon west of the Alexandria Canal that Alexander Hunter had platted in 1874 as the town of Abington. After moving into the White House upon his election to the Presidency, Garfield began the process of establishing a country home on his holding. Garfield's heirs and an improvement company continued to hold titles to that portion of the Abingdon estate until around the 1920s. Following the Civil War, Alexander Hunter (2nd) was employed for 40 years as a clerk in the federal General Land Office. In 1877-1879, he served as a Delegate in the Virginia General Assembly and as County Clerk of Alexandria. In 1881, Hunter advertised Abingdon for sale. During the same year, he sold his remaining Abingdon property at auction to the Alfred Richards Brick Company. The property at Abingdon that Hunter once owned are now within Ronald Reagan Washington National Airport, Crystal City and the Aurora Hills section of the Aurora Highlands neighborhood (see: List of neighborhoods in Arlington, Virginia). Abingdon became the subject of a legal case (Hunter v. Hume) that the Supreme Court of Virginia decided on June 18, 1891. Alexander Hunter (2nd) attempted to recover from Hume a disputed strip of Abingdon land that lay between the Washington and Alexandria Turnpike (now U.S. Route 1) to the east and the Alexandria Canal (now South Eads Street) to the west. The Court ruled that the strip had rightfully passed to Hume. In 1896, the Washington, Alexandria and Mount Vernon Railway began to run electric trolleys beside the abandoned Alexandria Canal west of Abingdon. By 1902, the railway was distributing a booklet for tourists that described Abingdon and other historic sites along its route. 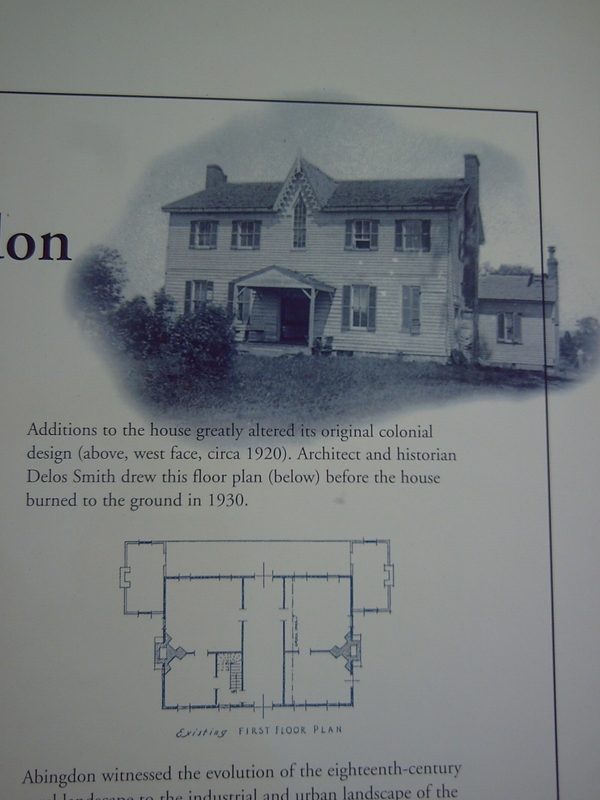 The booklet illustrated a house at Abingdon (identified as the "birth-place of Nellie Custis") that reportedly stood on the bank of Potomac River, a mile east of the railway's tracks beyond a brickyard. In 1900, the New Washington Brick Company purchased the Abingdon property. The company used steam shovels to dig yellow clay out of the fields at Abingdon for the production of brick used in the construction of buildings in nearby Washington, D.C. In 1912, the Daughters of the American Revolution reported in their magazine that Abingdon was "gradually being eaten away by the steam shovel before which modern invention many old landmarks must fall." Nevertheless, the Abingdon house was serving in 1922 as the residence of the brick company's superintendent and was in good condition. Vivian Allwine Ford, the supertendent's youngest child, was born in the Abingdon house in 1912 and lived there until 1922. The house at Abingdon that existed during the early 20th century had a wood-frame in the Georgian style that faced east and west. The house was painted white with green shutters, had a shingled hip roof, and had a scattering grove of big trees to the front and sides. At the east front was located Abingdon's principal garden where the land sloped gradually down to the Potomac River shore about five hundred yards away. Its beams and rafters were of a solid oak, two feet in diameter. It was two stories in height and exhibited red brick chimneys at the structure's north and south ends. In 1922, Lewis Smoot purchased the Abingdon House and 158 acres of the original estate. Smoot transplanted the boxwood bushes that had surrounded the house to his home's lawn in Washington, D.C. In 1924, Smoot sold the property to the Richmond, Fredericksburg and Potomac Railroad (RF&P), which planned to extend its rail yard (Potomac Yard) onto the property. From 1923 to 1927, members of the Beckwith family leased the Abingdon house and farmed the property's land. After the Beckwiths vacated the house, the RF&P tried to sell and give away the house's materials to reduce the costs of removing the structure. By 1928, the Abingdon house had become dilapidated. Visitors reported that people were tenting and enjoying a campfire nearby and that souvenir hunters had removed a cornerstone and parts of a chimney. In that year, the Washington Society of Alexandria asked the RF&P to defer the razing of the building until it could be restored. The Mt. Vernon Memorial Highway (now the George Washington Memorial Parkway) was constructed on Abingdon's grounds between 1929 and 1932. On March 5, 1930, a fire destroyed the unrestored Abingdon house. The Association for the Preservation of Virginia Antiquities (APVA) (now named "Preservation Virginia") then stabilized the house's ruins. In 1933, the APVA commemorated the site and placed a historical marker there. In addition, the Civilian Conservation Corps (CCC) worked on the Abingdon ruins, which in the early 1930s were located in the median of the George Washington Memorial Parkway. The CCC landscaped the grounds and built a parking lot, a concrete pad for a monument, and a cinder access road from the parkway to the site of the ruins. The CCC also built a reproduction well cover which was intended to be as close as possible to the design of the well house that was in use when Nelly Custis lived at Abingdon. 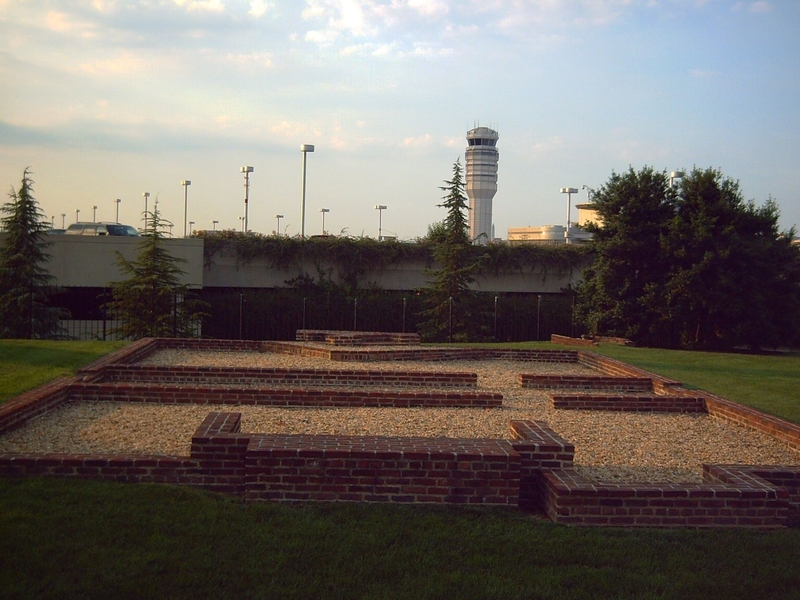 For more than 50 years thereafter, the Abingdon ruins remained largely undisturbed, despite the surrounding construction and expansion of Washington National Airport, which opened in 1941, and the construction of the nearby "Nelly Custis Airmen's Lounge". Photographs taken in 1934 and in the 1950s showed the conditions of parts of the ruins during that period. The Federal Aviation Administration of the United States Department of Transportation and other federal agencies owned and operated Washington National Airport until 1987. In that year, the airport was transferred to the newly formed Metropolitan Washington Airports Authority under a 50-year lease that the Metropolitan Washington Airports Act of 1986 (Title VI of Public Laws 99-500 and 99-591) had authorized. As a result, the Airports Authority obtained control of Abingdon's property, while the Federal government held title to the airport's lease. ... the Virginia Department of Historic Resources (State historic preservation office) concluded that there was insufficient evidence to link the existing "ruins" with any of the important historic individuals or families reported to have lived on the property. At the present time, there is no concrete evidence on the construction date or history of occupation of the structure represented by the existing ruins. ..... the undertaking of an appropriate archaeological data recovery program at the site and the construction of a "museum quality" interpretive exhibit to be located within the terminal complex. Once data recovery was performed, parking structure construction would follow. The basis for this recommendation was the intention to avoid an adverse effect to the Abingdon Site (through comprehensive archaeological data recovery and public interpretation program) while at the same time providing the desired amount of parking in the near-terminal area. The Airports Authority's actions ignited a public preservation effort that culminated in 1992 with legislation that the Virginia General Assembly enacted and that Governor L. Douglas Wilder approved. The legislation required the Airports Authority to "take all steps necessary to insure the preservation in place, the study, and the interpretation to the public" of the Abingdon ruins during a one-year period that followed the law's enactment. During that period, James Wilding, the general manager of the Airports Authority, reported to the Authority's planning committee that multiple options had been identified that would provide adequate parking without having to excavate the Abingdon site. Abingdon Plantation historical site, looking west from a Metrorail train passing through the airport (2014). In 1994, the Airports Authority entered into a Memorandum of Agreement with Virginia and federal officials that assured, among other things, that the resources and historic setting of the site would be protected and that disturbance of the site's archaeological deposits would be avoided during the airport's redevelopment, which was then proceeding. The Authority also issued a March 1994 "Preservation Plan" that summarized the measures that the Authority would take to preserve, repair and protect significant features of the site, while removing other features that the Authority did not consider to be of historic significance. In 1998, an Airports Authority contractor conducted an archaeological investigation of the Abingdon site, preserved and repaired some of site's remnants and removed others. 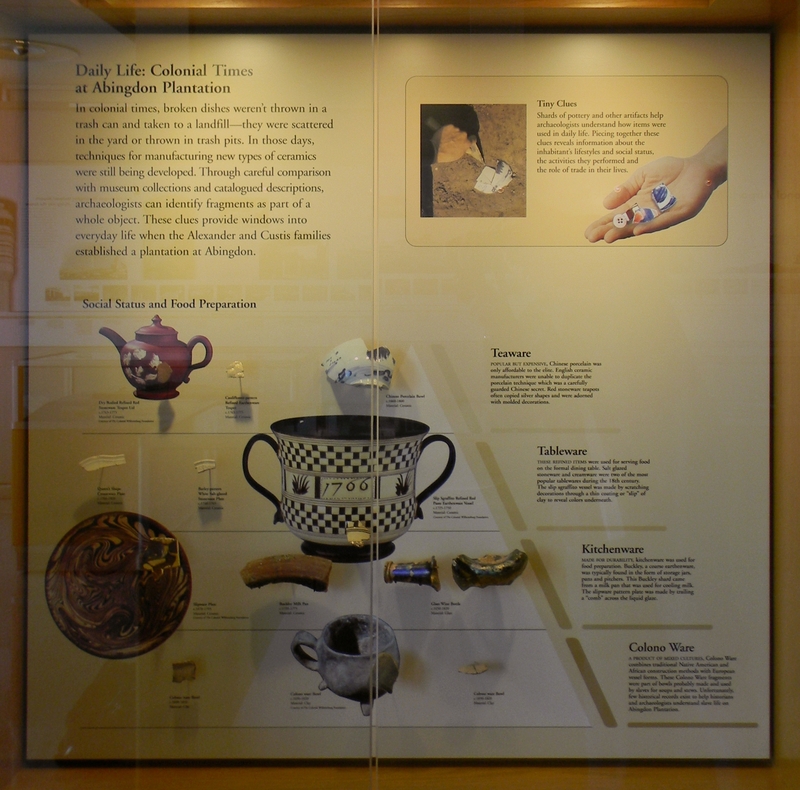 The Authority relocated some of the artifacts that the contractor had found at the site to a display in a new exhibit hall that the Authority constructed in the airport's original 1941 terminal (Terminal A). 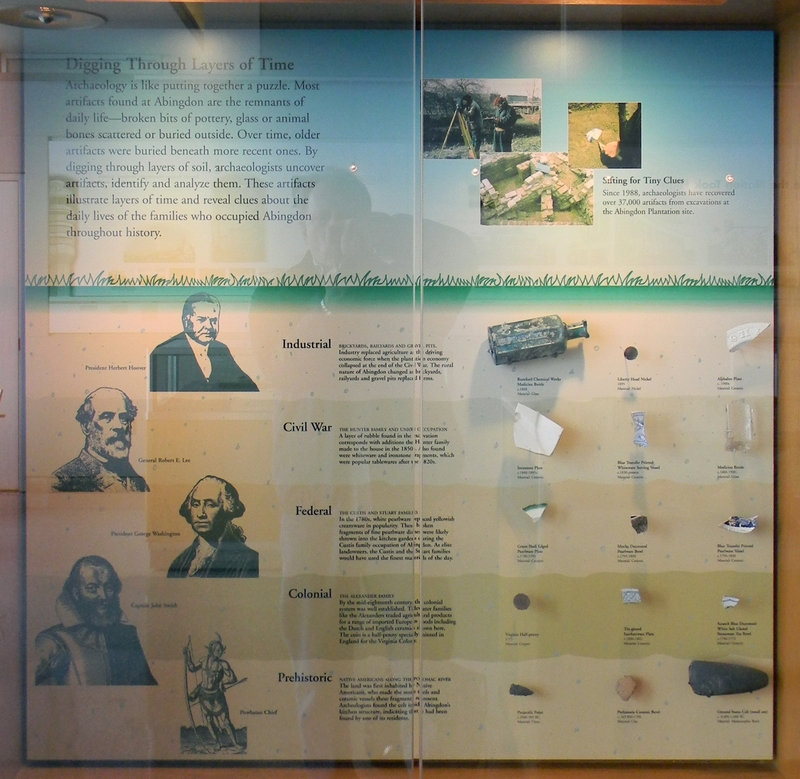 A panel in the exhibit hall later reported that archaeologists had recovered over 37,000 artifacts from the Abingdon site since 1988. 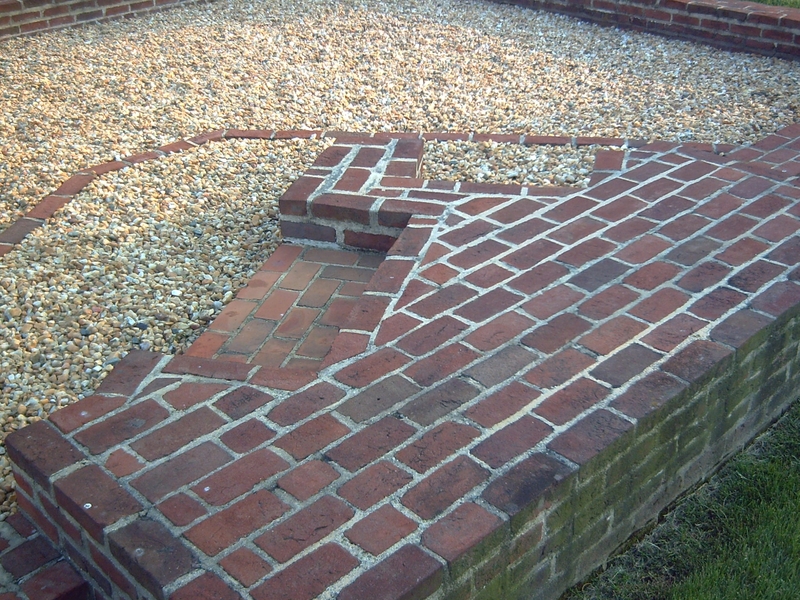 The contractor preserved parts of the brick foundations of the Abingdon house and its nearby kitchen, but not all remained visible. Some of the original foundation bricks were used to rebuild a 6 inches (15 cm)-high foundation over a new concrete base. Portions of the original foundations were restored using new building materials. As a result, when the Airports Authority completed the Abingdon site's restoration in 1998, the ruins were reportedly gone, the main foundation looked new and a well had been covered over. Photographs of the reconstructed Abingdon house foundation and kitchen/laundry taken in 2006, 2008 and 2009 illustrated the restoration's condition eight to eleven years later. A group of 2010 photographs also illustrated various features of the renovation and its surroundings. Abingdon Plantation Restoration historical marker, looking east with reconstructed Abingdon house foundation and Metrorail train in background (2013). The Abingdon Plantation site is located on a knoll between the airport's parking Garage A and Garage B/C. It can be reached by walking from either garage, from the south end of the nearby Ronald Reagan Washington National Airport Metrorail station and from the Mount Vernon Bike-Hike Trail. ^ a b c d e f g h Templeman, Eleanor Lee (1959). "Abingdon", Alexander-Custis Plantation. Arlington Heritage: Vignettes of a Virginia County. New York: Avenel Books, a division of Crown Publishers, Inc. pp. 12–13. OCLC 1173444. Retrieved 2017-12-26 – via Google Books. ^ a b c d e f g h i j k l m n o p q r s t Lowther, Minnie Kendall (1922). Abingdon - The Birthplace of Nellie Custis. Mount Vernon, Arlington and Woodlawn: history of these national shrines from the earliest titles of ownership to the present, with biographical sketches, portraits, and interesting reminiscences of the families, who founded them. Washington, D.C.: C. H. Potter & Co., Inc. pp. 57–58. OCLC 1106843 – via Google Books. ^ a b c d e f g Denniston, Eliza Olver, ed. (November 1912). "Passing of an Old Home". American Monthly Magazine. New York: National Society of the Daughters of the American Revolution. 41 (5): 200. Retrieved 2011-04-28. ^ a b c d e f (1) Lossing, Benson J. (May 1862). "American Historical Trees: Gate's Weeping Willow". Harper's New Monthly Magazine. New York: Harper & Brothers. 24 (144): 727–728. Retrieved 2011-05-06 – via Google Books. (2) Lossing, Benson J. (1871). The Weeping Willow. Scribner's Monthly 1871. New York: Charles Scribner's Sons, 1971. pp. 383–388. LCCN 72155058. OCLC 609717409. Retrieved 2017-12-26 – via HathiTrust Digital Library. (3) Lossing, Benson J. (1881-02-22). "The Weeping-Willow". Harper's Young People: an Illustrated History. New York: Harper & Brothers. 2 (69): 259–260. Retrieved 2011-05-06 – via Google Books. (4) Lossing, Benson J. (1889). "Washington's Last Surviving Bondswoman". Hours with the Living Men and Women of the Revolution: A Pilgrimage. New York: Funk & Wagnalls. pp. 171–172. OCLC 35622771. Retrieved 2017-12-26 – via Google Books. (5) Marden, Orison Swett; Devitt, George Raywood, eds. (1907). The Weeping Willow — Salix Babylonica. The Consolidated Library: A Popular Illustrated Library of The Arts, History, Commerce, Sciences, Biography, Finance, Literature, Geography, Statistics, Etc., Revised Edition. 4. New York and Washington: Bureau of National Literature and Art. pp. 439–440. OCLC 45212933. Retrieved 2011-05-06 – via Google Books. ^ a b c d e f g h i j k l Metropolitan Washington Airports Authority (1998-11-12). "Historic Site At Airport Open to Travelers And Public". Press Release. Metropolitan Washington Airports Authority. Archived from the original on 2015-11-15. Retrieved 2015-11-15. ^ a b c d e f g W., Kevin (2008-06-17). "Metropolitan Washington Airports Authority: "Abingdon Plantation: The Alexander Family" marker". HMdb.org: The Historical Marker Database. Archived from the original on 2012-10-21. Retrieved 2011-03-18. ^ a b c d e f g John Alexander Chapter, National Society of the Daughters of the American Revolution (April 2009). ""Abingdon and John Alexander" marker". Archived from the original on 2012-03-25. in Abingdon Marker (2010-03-01). John Alexander Chapter, National Society of the Daughters of the American Revolution Archived 2011-07-23 at the Wayback Machine. Retrieved 2011-03-18. ^ a b c d e f g h i j k l m n o p q r s Lockwood, Mary S. (1889). "The Homes Beyond the Potomac - Mount Vernon, Abingdon, Arlington". Historic Homes in Washington: Its Noted Men and Women. New York: Belford Co. pp. 201–203. OCLC 9534690. Retrieved 2011-04-28 – via Google Books. ^ "John Alexander, Patriot". Alexandria, Virginia: John Alexander Chapter, National Society of the Daughters of the American Revolution. 2010-05-07. Archived from the original on 2012-04-26. Retrieved 2012-01-01. ^ "Early European Settlement and the Founding of Alexandria". A Brief History of Alexandria. City of Alexandria, Virginia. 2011-01-03. Archived from the original on 2012-03-24. Retrieved 2011-03-17. ^ a b Kail, Wendy (2009). "Martha Parke Custis Peter". The Papers of George Washington. University of Virginia Library: Alderman Library. Archived from the original on 2015-04-02. Retrieved 2015-03-05. ^ a b c d e f g Yates, Bernice-Marie (2003). The Perfect Gentleman: The Life and Letters of George Washington Custis Lee. Fairfax, Virginia: Xulon Press. pp. 35–39. ISBN 1-59160-451-6. OCLC 54805966. Archived from the original on 2014-01-01. Retrieved 2015-03-05 – via Google Books. ^ a b c d Grizzard, Frank E., Jr. (2002). "Custis, John Parke ("Jacky"; 1754-1781)". George Washington: A Biographical Companion. Santa Barbara, California: ABC-CLIO, Inc. p. 69. ISBN 1-57607-082-4. OCLC 53275803. Archived from the original on 2016-06-09 – via Google Books. ^ (1) F., Robby, Baltimore, Maryland. "Maryland Historical Society: "Mount Airy" marker". Archived from the original on 2012-10-21. Retrieved 2011-06-07. in Robby, F (2008-06-17). "Mount Airy". HMdb.org The Historical Marker Database. .
^ a b Johnson, R. Winder (1905). The Ancestry of Rosalie Morris Johnson: Daughter of George Calvert Morris and Elizabeth Kuhn, his wife. Ferris & Leach. pp. 16–17, 29–30. OCLC 5383615. Archived from the original on 2014-01-04. Retrieved 2011-05-20 – via Google Books. ^ Daughters of the American Revolution: Nelly Custis Chapter. 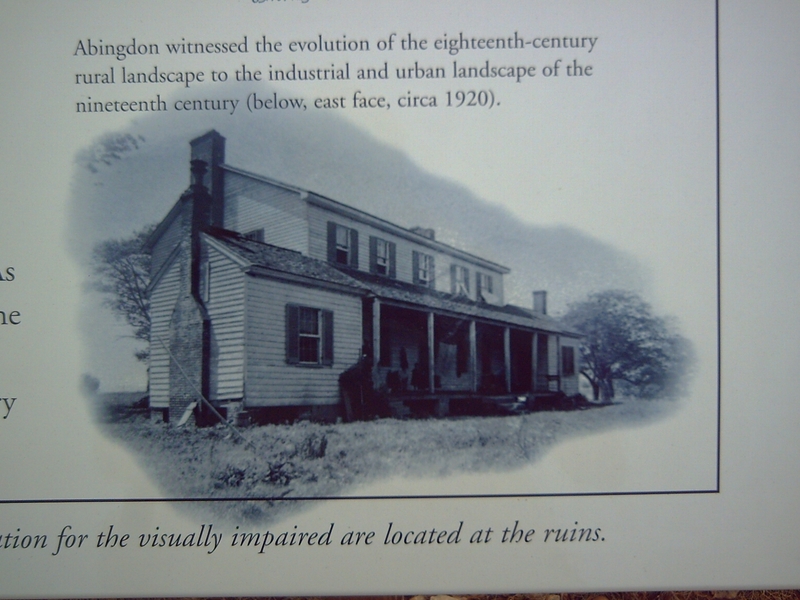 "Historic Preservation of Abingdon Plantation". Mount Vernon, Virginia: Daughters of the American Revolution: Nelly Custis Chapter. Archived from the original on 2007-12-02. Retrieved 2011-12-29. ^ a b c d e W., Kevin, Stafford, Virginia (2008-06-17). "Metropolitan Washington Airports Authority: "Abingdon Plantation: The Custis Family" marker". Archived from the original on 2012-10-21. Retrieved 2011-03-18. ^ Smith, Delos (1929). "The Abingdon of Fairfax County". Daughters of the American Revolution Magazine. National Society of the Daughters of the American Revolution. 63: 325. Archived from the original on 2014-01-04. Retrieved 2011-06-28 – via Google Books. ^ a b Hirschfeld, Fritz (1997). George Washington and Slavery: A Documentary Portrayal. Columbia, Missouri: University of Missouri Press. p. 184. ISBN 0-8262-1135-6. OCLC 45844284. Archived from the original on 2014-01-04. Retrieved 2011-06-28 – via Google Books. ^ a b Lee, Edmund Jennings (2008). Lee of Virginia, 1642–1892: Biographical and Genealogical Sketches of the Descendants of Colonel Richard Lee. Westminster, Maryland: Heritage Books. pp. 95–96. ISBN 0-7884-2103-4. OCLC 233546866. Archived from the original on 2014-01-04. Retrieved 2011-06-28 – via Google Books. ^ Crew, Harvey W.; Webb, William Bensing; Wooldridge, John (1892). IV. Permanent Capital Site Selected. Centennial History of the City of Washington, D.C. Dayton, Ohio: United Brethren Publishing House. pp. 87–88, 101. OCLC 2843595. Archived from the original on 2013-06-22. Retrieved 2011-06-01 – via Google Books. ^ Stetson, Charles Wyllys (1935). Four Mile Run Land Grants. Washington, D.C.: Mimeoform Press. p. 37. OCLC 31762440 – via Google Books. ^ a b c d e f g h i W., Kevin, Stafford, Virginia (2008-06-18). "Metropolitan Washington Airports Authority: "Abingdon Plantation: The Hunter Family" marker". HMdb.org The Historical Marker Database. Archived from the original on 2012-10-21. Retrieved 2011-03-18. (2) Swenson, Ben (2013-02-04). "Reagan National Airport and the Mother of All Weeping Willows". Abandoned Country: Disappearing history and the natural world reclaiming it. WordPress. Archived from the original on 2014-07-10. Retrieved 2014-07-14. ^ a b c d Dodge, George W.; Holien, Kim B. (2006). "The Union Soldier Presence at Arlington during the Civil War". Arlington National Cemetery. Charleston, South Carolina: Arcadia Publishing. pp. 30–31. ISBN 0-7385-4326-8. OCLC 76416297. Archived from the original on 2014-01-03 – via Google Books. ^ "An act for the collection of the direct tax in insurrectionary districts within the United States and for other purposes". A Compilation of the Direct Tax Laws of the United States from August 5, 1861. Washington, D.C.: United States Government Printing Office. pp. 25–30. Archived from the original on January 7, 2014 – via Google Books. ^ a b Bennett v. Hunter – via Wikisource. ^ a b c d Wallace, John William (1870). "Bennett v. Hunter". Cases argued and adjudged in the Supreme Court of the United States, December Term, 1869. Washington, D.C.: William H. Morrison. 9: 326–338. Archived from the original on 2013-10-14. Retrieved 2011-08-22 – via Google Books. ^ a b Bromberg, p. 16. ^ Ashmore, Anne (August 2006). "Dates of Supreme Court Decisions and Arguments: United States Reports: Volumes 2 — 107 (1791-1882)" (PDF). Washington, D.C.: Library, Supreme Court of the United States. p. 96. Archived (PDF) from the original on 23 July 2011. Retrieved 2011-08-22. ^ a b Culbertson, Sidney Methiot (1934). The Hunter Family of Virginia and Connections: Embracing Portions of Families of Alexander, Pearson, Chapman, Travers, Tyler, West, Grey, Smith, and Safford of Virginia. Denver, Colorado. p. 203. OCLC 246177904. Retrieved 2011-07-07 – via Google Books. Cited in Blow, John M. "Re. Alexander Hunter, Abingdon Plantation, VA". GenForum. Ancestry.com. Archived from the original on 2012-03-19. Retrieved 2011-07-07. (2) "Aurora Highlands NC Plan Update" (PDF). Arlington County, Virginia: Arlington County Department of Community Planning, Housing and Development. 2008. Archived from the original (PDF) on 2015-09-23. Retrieved 2015-11-15. ^ a b c Hansbrough, George W. (1892). "Hunter v. Hume, June 18th, 1891, Wytheville". Reports of Cases Decided in the Supreme Court of Appeals of Virginia. Richmond, Virginia: J. O'Bannon, Superintendent of Public Printing. 88: 24–30. Retrieved 2011-06-28 – via Google Books. ^ a b c Lacy, J. (1892). "Hunter v. Hume (Supreme Court of Appeals of Virginia, June 18, 1891)". The Southeastern Reporter, Containing All of the Decisions of the Supreme Courts of Appeals of Virginia and West Virginia, and Supreme Courts of North Carolina, South Carolina, Georgia, April 28, 1891 — January 5, 1892. National Reporter System — State Series. 13 (permanent ed.). St. Paul: West Publishing Company. pp. 305–308 – via Google Books. ^ a b Miller, Richard E., Oxon Hill, Maryland (2009-09-15). Swain, Craig (ed.). ""Transportation" marker". HMdb.org: The Historical Marker Database. Archived from the original on 2015-09-23. Retrieved 2015-09-22. .
^ a b c d e f W., Kevin, Stafford, Virginia (2008-06-18). "Metropolitan Washington Airports Authority: "Abingdon Plantation: The Industrial Age" marker". HMdb.org: The Historical Marker Database. Archived from the original on 2012-10-21. Retrieved 2011-03-18. ^ a b Collins, Sarah J. (October 2005). W. Karl VanNewkirk (ed.). "Vivian Allwine Ford". The Arlington Historical Magazine. Arlington, Virginia: The Arlington Historical Society, Inc. 13 (1): 19–20. ^ "Obituary: Vivian Alwine Ford, Danville, Virginia, December 31, 1912 - April 14, 2014". Alexandria, Virginia: Everly-Wheatly Funeral Home. Archived from the original on 2014-07-15. Retrieved 2015-09-22. Most of her youth was spent growing up at the Abingdon Plantation which was also the birth place of Nelly Custis, they lived there until 1922 when the family moved to South 20th St in Arlington. ^ (1) Image of photograph of east face of Abingdon House, circa 1920: W., Kevin, Stafford, Virginia (2008-06-12). "The Abingdon House". Metropolitan Washington Airports Authority: "Abingdon Plantation: The Ages of Abingdon" marker. HMdb.org The Historical Marker Database. Archived from the original on 2014-01-12. Retrieved 2011-06-24. (2) Image of photograph of west face of Abingdon House, circa 1920: W., Kevin, Stafford, Virginia (2008-06-12). "The Abingdon House". Metropolitan Washington Airports Authority: "Abingdon Plantation: The Ages of Abingdon" marker. HMdb.org: The Historical Marker Database. Archived from the original on 2014-01-12. Retrieved 2011-06-24. ^ a b W., Kevin, Stafford, Virginia (2008-06-17). "Metropolitan Washington Airports Authority: "Abingdon Plantation: The Ages of Abingdon" marker". HMdb.org: The Historical Marker Database. Archived from the original on 2012-10-21. Retrieved 2011-03-18. ^ a b c d e f Washington National Airport: Historic Preservation Aspects of the Middle/North Parking Structure Design and the Associated Preservation Plan for the Abingdon Site. Washington Metropolitan Airports Authority. March 1994. OCLC 229162568. (2) "Abingdon Plantation, c.1930". Alexandria, Virginia, Library: Special Collections. Archived from the original (photograph) on 2014-07-14. In Rice, Allison (November–December 2013). "Hidden in Plain Sight". Arlington Magazine. Archived from the original on 2014-07-15. Retrieved 2014-07-14. ^ Davis, Timothy; Croteau, Todd; Payne, R.D. "A Model Parkway". Highways in Harmony: George Washington Memorial Parkway, Virginia, Maryland, Washington D.C. (leaflet). Historic American Buildings Survey/Historic American Engineering Record, National Park Service, U.S. Department of the Interior. Archived from the original on 2012-11-08. Retrieved 2014-07-15. ^ (1) "Old Nellie Custis Home Destroyed by Brush Fire: Flames Level Abingdon Mansion Once Property of George Washington". The Washington Post. Washington, D.C. 1930-03-06. p. 1. Archived from the original on 2017-07-01. Retrieved 2017-07-01. (2) Del Giudice, Vinny, ed. (2008-05-28). "Abingdon Plantation — 1930". Arlington Fire Journal. Archived from the original on 2011-10-03. Retrieved 2011-06-14. ^ Davidson, pp. 21, 82. ^ (1) Photograph: The Abingdon ruins with the CCC-constructed parking area behind, 1934. In Davidson, p. 161. (2) Templeman, Eleanor Lee. "Abingdon Plantation ruins, 1950s" (photograph). photostream. Arlington, Virginia: Arlington Public Library. Retrieved 2016-04-17 – via Flickr (2008-09-23). ^ (1) "MWAA History and Facts". About the Airports Authority. Metropolitan Washington Airports Authority. Archived from the original on 2015-09-14. Retrieved 2015-09-14. (2) "Title 49: Chapter 491 - Metropolitan Washington Airports" (PDF). United States Code. United States Government Publishing Office. 2011. Archived from the original (pdf) on 2015-09-14. Retrieved 2015-09-14. ^ Henderson, Nell (1990-01-04). "Airport Debate Amid the Ruins". Weekly-Virginia. The Washington Post. Washington, D.C. p. v.01. Archived from the original on 2017-06-30. Retrieved 2017-06-30. ^ (1) Pratt, p. 347. (2) Lindsey, David (1990-06-22). "Airport May Remove Abingdon Ruins; Advisory Panel Suggests Building 750 Parking Spaces on Site". Metro. The Washington Post. Washington, D.C. p. D.03. Archived from the original on 2017-07-01. Retrieved 2017-07-01. (3) Berne, Bernard H. (1990-07-09). "Paving Over The Past (letter to the editor)". OP/ED. The Washington Post. Washington, D.C. p. A.10. Archived from the original on 2017-06-30. Retrieved 2017-06-30. ^ Parsons Management Consultants (1991), pp. 40-41. Section 28. Preservation of Abingdon Plantation House ruins.—The Authority shall take all steps necessary to insure the preservation in place, the study, and the interpretation to the public of the Abingdon Plantation House ruins and Historic Site at Washington National Airport. Notwithstanding any powers and duties that may be conferred upon it in section 5 of this act or elsewhere, the Authority shall neither undertake nor permit the undertaking of any transportation program or project, including, but not limited to, the construction of motor vehicle parking facilities, roads, or other structures intended for uses related to transportation, if any such program or project requires the use of any land that is occupied by the Abingdon Plantation House ruins and Historic site. Any program or project on neighboring lands shall include all possible planning to minimize harm to the ruins and Historic Site resulting from such use. The provisions of this act shall expire on April 1, 1993." ^ Bates, Steve (1992-11-20). "Manor's Ruins May Be Saved, Airport Says". Metro. The Washington Post. Washington, D.C. p. D.06. Archived from the original on 2017-06-30. Retrieved 2017-06-30. ^ (1) "National Airport: Plantation to be spared". Fredericksburg, Virginia: The Free Lance-Star. Associated Press. 1992-11-21. Archived from the original on 2016-01-24. Retrieved 2016-01-24 – via Google Books. ^ (1) Wilding, James, General Manager, Washington Metropolitan Airports Authority; Wise, Jr., W. Alexander, Virginia State Historic Preservation Officer; Bush, Robert, Executive Director, Advisory Council on Historic Preservation (October 5, 11 and 20, 1994). "Memorandum of Agreement for the Middle/North Parking Structure: Washington National Airport". ^ Hong, Peter Y. (1994-04-22). "Airport Board Has Plan to Save Historic Ruins". The Washington Post. Washington, D.C. p. A.46. Archived from the original on 2017-04-10. Retrieved 2017-04-10. A parking garage originally planned for the site of the Abingdon plantation house will be scaled back from 5,000 to 4,376 cars and moved to a position adjacent to the ruins of the 200-year-old structure. The airport authority also will spend $500,000 improving the Abingdon site by building a pedestrian bridge from the garage to the ruins, building a pathway to the remains of the house and removing underbrush and other plants. ^ Greenhorn & O’Mara, Inc.(1999). Archaeology of the Abingdon Plantation Site (44AR18), Ronald Reagan Washington National Airport, Arlington County, Virginia. Report AR-46 on file with the Virginia Department of Historic Resources, Richmond, VA. Cited in Jia, Wendy. Virginia State Historic Preservation Officer (SHPO) Project Review Application Form: Crystal City/Potomac Yard Transit Improvements Project, Arlington, Virginia. Washington, D.C.: Washington Metropolitan Area Transit Authority. p. 4. in "Technical Memorandum Update: Appendix 5 (Cultural Resources): Attachment A (SHPO Project Review Form)" (PDF). Crystal City/Potomac Yard Transit Improvements. Washington Metropolitan Area Transit Authority. August 2010. Archived from the original (pdf) on 2014-07-15. Retrieved 2014-07-15. ^ a b c Daly, Rich (1998-06-29). "Touching down on the 18th century: Airport lifts Abingdon from ruins". Arlington Journal. pp. A1, A6. 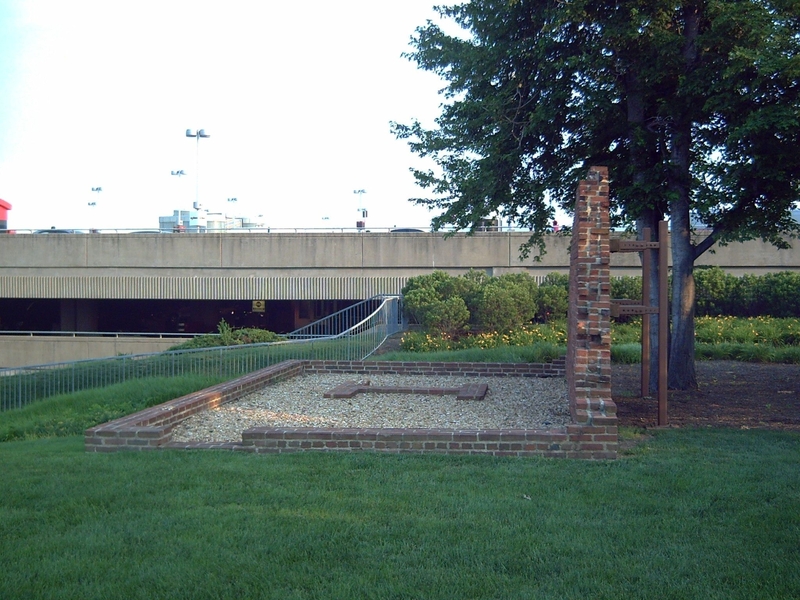 A nearly $1 million historic preservation project by the Metropolitan Washington Airports Authority has begun to shape the ruins into a clearly visible brick foundation. .... Assisted by a historical excavation expert, the Greenhorne and O'Mara architecture and engineering design firm is using some of the original foundation bricks to rebuild a 6-inch high foundation over a new concrete base. "We're trying to make it so people can see what it was like at the time," said David Jones, authority design manager. ^ Sipress, Alan (1998-11-11). "At National Airport, A Historic Destination: On Acre Nestled Between Parking Garages Are Restored Ruins of Colonial Plantation". Metro. The Washington Post. Washington, D.C. pp. B1, B7. Archived from the original on 2016-11-16. Retrieved 2016-11-16. ^ a b c d e W., Kevin, Stafford, Virginia (2008-06-17). "Metropolitan Washington Airports Authority: "Abingdon Plantation" marker". HMdb.org: The Historical Marker Database. Archived from the original on 2012-10-21. Retrieved 2011-03-18. ^ (1) McCaffrey, Scott (1998-11-19). "History Comes Alive at National Airport: Preservationists Not All Pleased With the Results". Northern Virginia Sun Weekly. pp. 16, 17. (2) Berne, Bernard H., Arlington, Virginia (2011-05-25). Comment on "Abingdon House Ruins" photograph. In W., Kevin, Stafford, Virginia (2008-06-18). "Metropolitan Washington Airports Authority: "Abingdon Plantation: Restoration" marker". HMdb.org: The Historical Marker Database. Archived from the original on 2015-07-12. Retrieved 2015-11-15. ^ 2006 photographic images of Abingdon plantation house Historic Site by hey-helen (2006-06-06). Flickr. Retrieved 2015-12-21. (1) "Reconstructed Abingdon House foundation". Archived from the original on 2014-11-29. Distant view, looking northeast with Metrorail train in background and air Terminal B/C in far background. (2) "Reconstructed Abingdon House foundation". Archived from the original on 2014-11-29. Close-up view, looking northeast with Metrorail in background and air Terminal B/C in far background. (3) "Reconstructed Abingdon kitchen/laundry". Archived from the original on 2014-12-02. Looking northeast, with reconstructed Abingdon House foundation and air traffic control tower in background. (1) "Reconstructed Abingdon House Foundation". Archived from the original on 2016-03-04. Looking north, with Garage B/C and air traffic control tower in background. (2) "Reconstructed Abingdon Kitchen/Laundry". Archived from the original on 2016-03-04. Looking south, with Garage A in background. (3) "The Alexander Family Marker". Archived from the original on 2016-03-04. Behind the marker is the reconstructed remains of a kitchen/laundry structure added later in the plantation's history. Looking southwest, with Garage A in background. (4) "Compound parlor hearths on the north end of the house". Archived from the original on 2016-03-04. ^ 2009 photographic images of Abingdon plantation house Historic Site: Dan S. (2009-08-23). "Abingdon Plantation Ruins". 12 Mile Circle: An Appreciation of Unusual Places. Archived from the original on 2011-02-05. Retrieved 2015-12-21. (1) "Reconstructed Abingdon House foundation". Archived from the original on July 15, 2014. Looking east, with Metrorail in background and air Terminal B/C in far background. 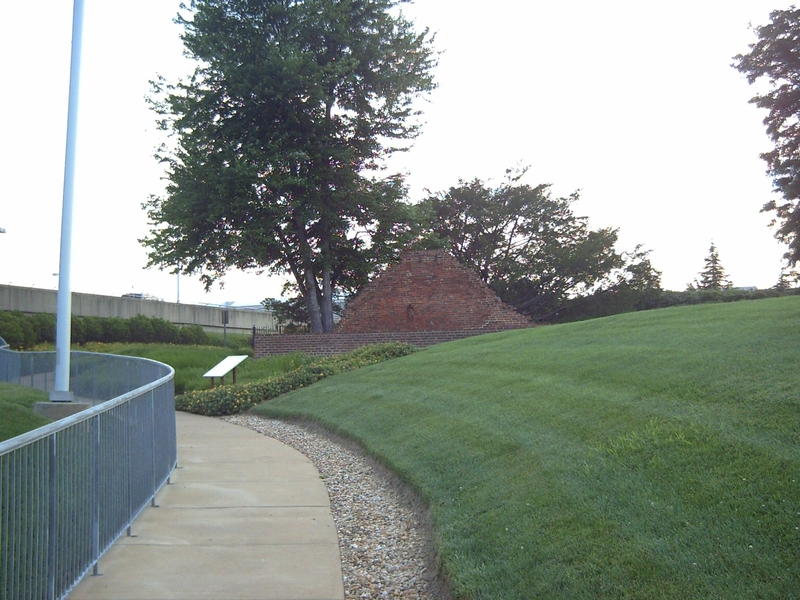 (2) "Restored wall and reconstructed foundation of Abingdon kitchen/laundry". Archived from the original on July 15, 2014. Looking northwest, with Garage B/C in background. (3) "Reconstructed foundation of Abingdon house". Archived from the original on July 14, 2014. Looking south, with restored wall and reconstructed foundation of Abingdon kitchen/laundry in background and Garage A in far background. (4) "East side of Abingdon Plantation site". Archived from the original on July 14, 2014. Looking east, with Metrorail train in background. (5) "Northeast corner of Abingdon plantation site". Archived from the original on July 14, 2014. Looking northeast, with Garage B/C in left foreground, entrance to Abingdon Plantation site in center foreground, walkway to Garage A in right foreground, elevator bank in left-center background, pedestrian bridge to Metrorail station in right background, airport control tower in far background (right-center), and Metrorail station in far background (right). ^ a b (1) Airport map showing locations of air terminals, Metro station, parking garages and Abingdon Plantation site: "Parking Map". Metropolitan Washington Airports Authority. January 2015. Archived from the original on 2015-03-22. Retrieved 2015-07-11. 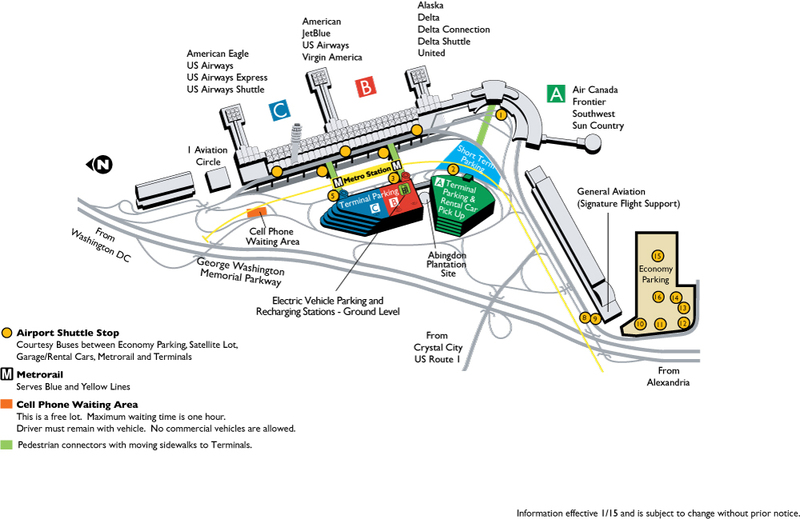 (2) "Ronald Reagan Washington National Airport (map)". StationMasters Online: StationMasters Guide to Metrorail Station Neighborhoods. Arlington, Virginia: Bowring Cartographic. 2008. Archived from the original on 2011-07-16. Retrieved 2011-10-20. ^ Cressey, Pamela J. (2002). Walk and Bike the Alexandria Heritage Trail: A Guide to Exploring a Virginia Town's Hidden Past. Sterling, Virginia: Capital Books. pp. 16–17. ISBN 1-892123-89-4. OCLC 48613607. Archived from the original on 2014-01-04. Retrieved 2011-06-16 – via Google Books. Abbott, Dorothea E. (October 1982). "The Hunter Family and its Connection with Arlington County". The Arlington Historical Magazine. Arlington, Virginia: The Arlington Historical Society, Inc. 7 (2): 36–43. Bromberg, Francine Weiss; Crowell, Elizabeth A.; Barr, Keith (1988-12-19). Historic Management Plan: Abingdon Plantation: National Airport: Arlington County, Virginia. Submitted to Metropolitan Washington Airports Authority. Parsons Management Consultants. OCLC 744476222. Davidson, Lisa Pfueller; Jacobs, James A. (Compiled after 1933). "Historic American Buildings Survey: Civilian Conservation Corps Activities in the National Capital Region of the National Park Service: HABS No. DC-858" (PDF). Washington, D.C.: National Mall & Memorial Parks: National Park Service: United States Department of the Interior. Archived from the original (PDF) on 2014-07-14. Retrieved 2014-07-14 – via Library of Congress website. Dodge, George (October 1999). W. Karl VanNewkirk (ed.). "The Abingdon of Alexander Hunter, Et Al". The Arlington Historical Magazine. Arlington, Virginia: The Arlington Historical Society, Inc. 11 (3): 43–53. Hunter, Alexander (1905). Johnny Reb and Billy Yank. New York and Washington, D.C.: The Neale Publishing Company. ISBN 1568520808. LCCN 05004283. OCLC 2234699. Retrieved 2011-06-27 – via Google Books. Metropolitan Washington Airports Authority (March 1994). Washington National Airport : historic preservation aspects of the middle/north parking structure design and the associated preservation plan for the Abingdon Plantation site. Metropolitan Washington Airports Authority. OCLC 229162568. Parsons Management Consultants and Engineering Science, Inc. (November 1991). Abingdon Archaeological Site: Historic Preservation Alternatives Assessment. Prepared for Metropolitan Washington Airports Authority. Pratt, Sherman (1997). "The Effort to Save the Abingdon Ruins". Arlington County Virginia: A Modern History. Sherman W. Pratt, printed by Book Crafters, PO Box 370, Chelsea, MI 48118. pp. 336–363. ISBN 0-9661795-0-1. LCCN 97077077. OCLC 38599754 – via Google Books. Rose, C.B., Jr. (1976). Arlington County, Virginia: A History. Arlington Historical Society, Inc. LCCN 76005938. OCLC 2401541 – via Google Books. Snowden, William H. (1902). Some Old Historic Landmarks of Virginia and Maryland, Described in a Hand-book for the Tourist Over the Washington, Alexandria and Mount Vernon Electric Railway (3rd ed.). Alexandria, Virginia: G.H. Ramey & Son. OCLC 6234650 – via Google Books. Walker, Mark; Bromberg, Francine; Barr, Keith; Crowell, Elizabeth A. (August 1989). Phase II Archeological Study:Abingdon Plantation Site: Washington National Airport. Submitted to Metropolitan Washington Airports Authority. Parsons Management Consultants. OCLC 744476223. Wilstach, Paul (1921). "Potomac Landings". Garden City, New York: Doubleday, Page & Company. OCLC 2536263. Retrieved 2011-06-27 – via Google Books. Wikimedia Commons has media related to Abingdon (plantation). "Site of Abingdon Plantation House - History Alexandria Virginia". Norglobe, Inc. 2008-06-10. Retrieved 2011-06-24. Adapted by localKicks from Madison, Robert L. (2003). Walking with Washington: walking tours of Alexandria, Virginia; featuring over 100 sites associated with George Washington. Alexandria, Virginia: Gateway Press. OCLC 53039077 – via Google Books.